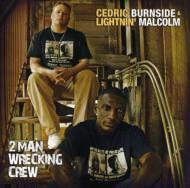 Drummer Cedric Burnside, grandson of the legendary R.L. Burnside, teams up with guitar bluesman Lightnin' Malcolm, one of the leading younger generation artists on the scene today, for a backwoods set of music firmly rooted in the Delta. Over the years they've worked with the best Mississippi legends in blues including R.L. Burnside, Junior Kimbrough, T-Model Ford, Jessie Mae Hemphill, Hubert Sumlin and the North Mississippi All-Stars. Together they have crafted a sound reminiscent of minimalist rock duos such as The Black Keys or The White Stripes, while still retaining a sound uniquely their own. CD will be serviced to AAA, NPR, Satellite, College, Americana & Blues radio.